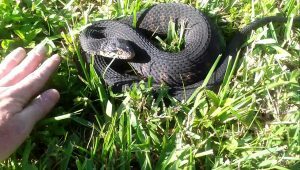 The Banded Water Snake (also called the southern water snake) is a species of aquatic snake widely distributed in parts of the United States. 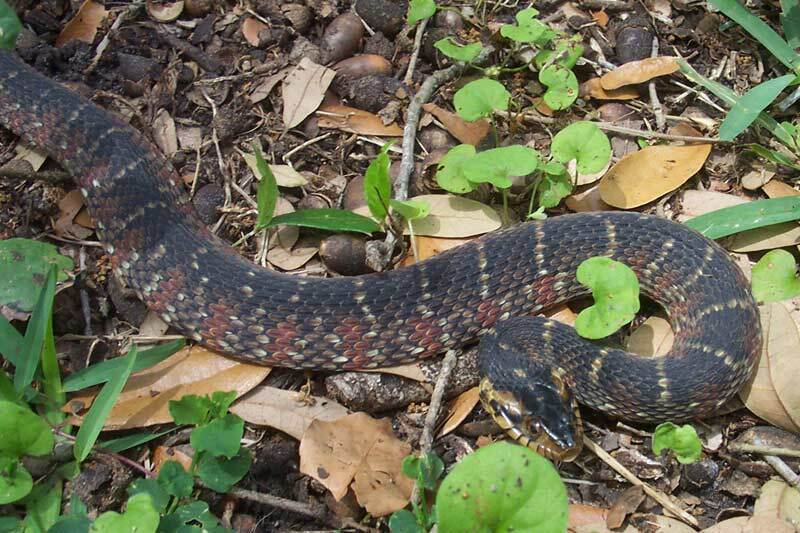 These snakes, like other colubrid species, are non-poisonous and are harmless to humans. Identification: The skin is rough, while the entire body is reddish or brownish tan with broad cross-bands in a darker shade bordered by black. The belly is tan or yellow, having black or dark brown marks and large triangular or rectangular spots. Size: The total length from the tip of the mouth to the tail-tip is 61 to 106.7 cm (24.0 to 42.0 in). Weight: On an average, they weigh around 464.3 g.
Head: Small round eyes set by the two sides of the flat head, just above the nose (nostrils). Their vision is very poor like most other snake species. The tongue is split. They can live for a maximum of 8 years in the wild, and around three years in captivity. 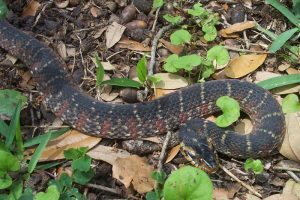 Endemic to the central and southeastern United States, the banded water snakes are found from Indiana, towards the south to Louisiana and the east towards Florida. These serpents mostly prefer living in freshwater bodies like ponds, lakes, marshes, and streams. 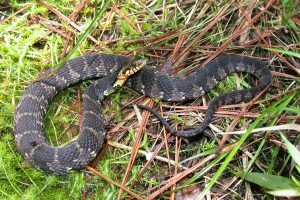 These snakes, practically, have a timid disposition and would take to fleeing without a thought if they are intimidated or feel nervous by any external factor. If attacked, picked up, or made to feel threatened, and they find no chance to escape, they would bite and release a foul-smelling musk or secretion to ward off predators or enemies. 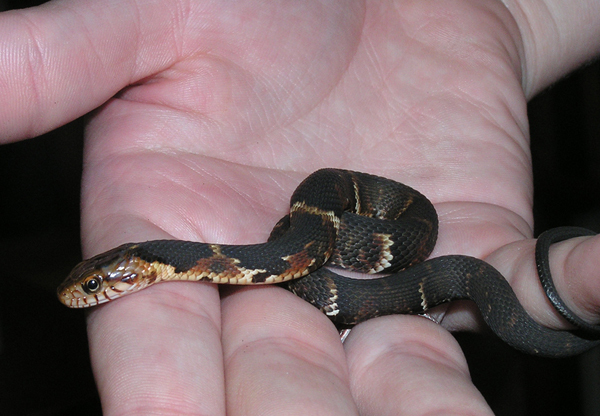 However, as pets, banded water snakes have been seen picking up food from the hand of humans. The snakes are predominantly nocturnal, but they are seen both during the day, as well as night time. They are very skilled swimmers and spend almost two-thirds of their lifetime in the water. In the winter months, they usually hibernate inside burrows, or else, underneath rocks and large logs. Even during harsh, dry summers, or in case of droughts, they will leave the area to move to a more secured aquatic habitat suitable for living and to find food easily. Since they are primarily aquatic to semi-aquatic creatures, the primary diet of the banded water snake includes animals living mostly living in the water like frogs, toads, and fish. They would also eat tadpoles and salamanders. 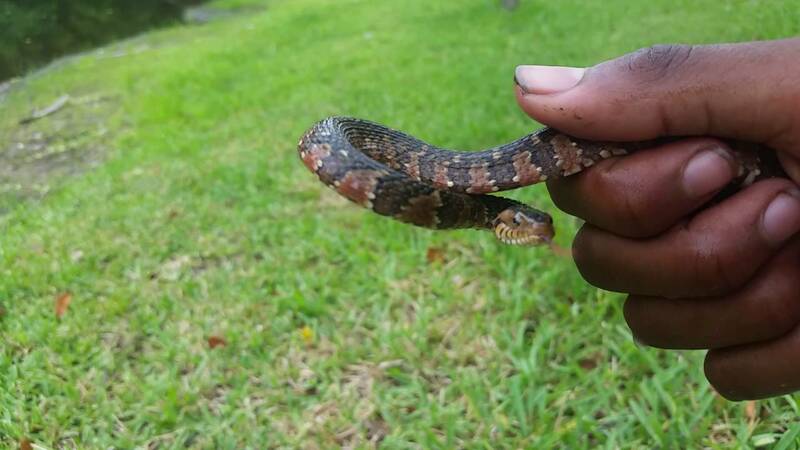 Southern water snakes breed once a year, with the breeding season being between early July and late October. After a successful mating session, the female bear eggs inside of its belly. This species is ovoviviparous, that is, they give birth to live young, while the eggs are fertilized and hatched inside the mother’s body. The average gestation period of the female snakes is around 79 days. Baby snakes are generally born during summer, between May and August, though the timing sometimes varies between subspecies. The offspring are born with bright long patterned skin and are around 8 inches in length. The clutch size can be anything between 9 and 57, depending upon external factors like weather, range, etc. Quite like their parents, if provoked, the babies will immediately become aggressive and strike, as well as, release a stinking musk. Both the male and the female juveniles would attain the age of sexual maturity at about 2 to 3 years. Like most other snakes, using its vomeronasal organ, also called Jacobson’s organ, the animal is able to detect parvalbumins in the cutaneous mucus of its prey, thus locating it becomes easy. The banded water snakes are often mistaken for the venomous species like the cottonmouth (water moccasin) and the copperhead snakes, mainly because of their brownish red coloration along with the black markings. This mimic is a natural instrument for self-defense so as to confuse predators. As a behavioral adaptation, the reptile often flattens its body and head to make it look larger, if cornered. 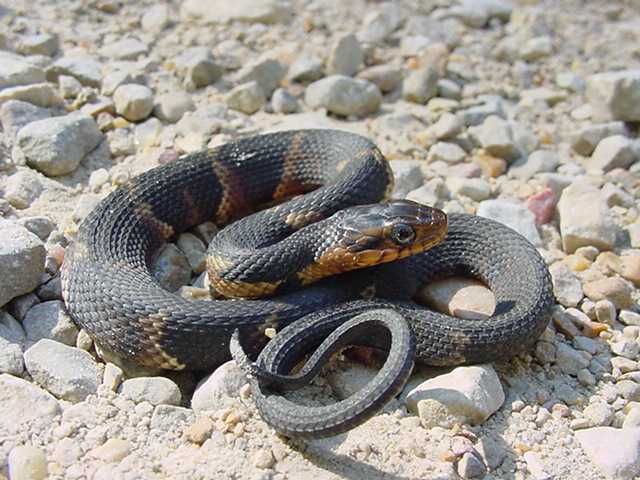 The primary enemies of the banded water snake are other larger snakes, birds of prey like the great blue heron, and semi-aquatic creatures like an alligator. 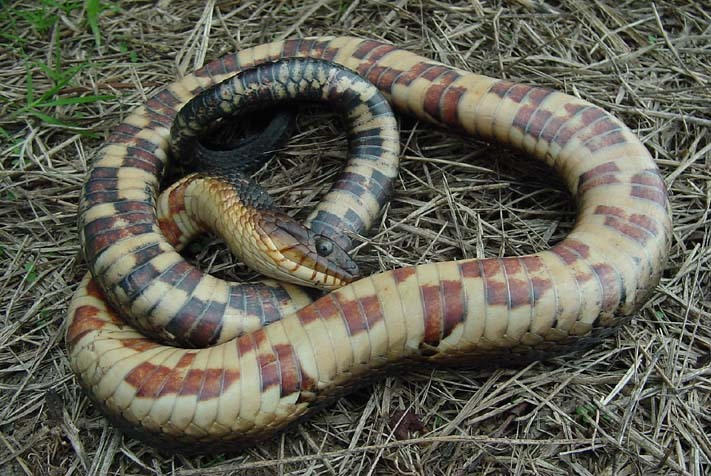 The population of this species is stable, and the IUCN 3.1 has categorized this snake as ‘LC’ (Least Concern). 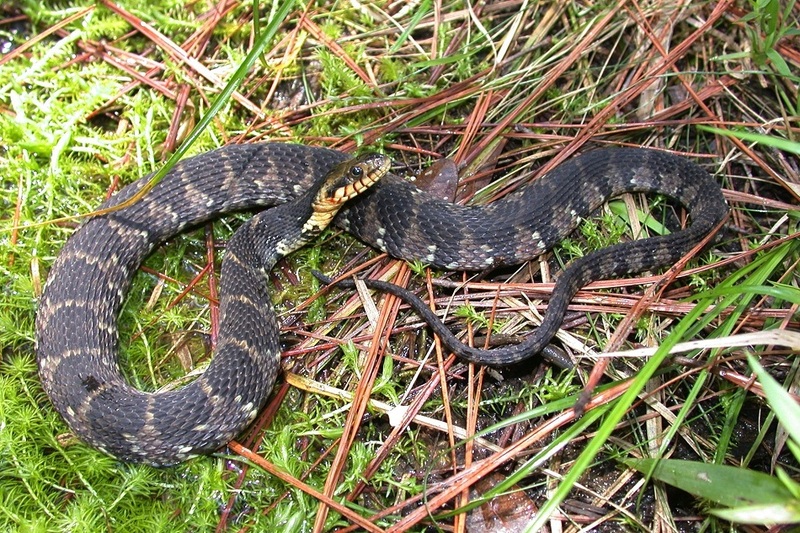 Banded water snakes are protected throughout the US state of Georgia. The snake has been recorded to remain underwater for more than 20 minutes. Their generic name Nerodia has come from the Greek words ‘neros’ meaning “flowing” or “liquid”, and ‘dia’ meaning “through”.